All In VIP Experiences are available now! 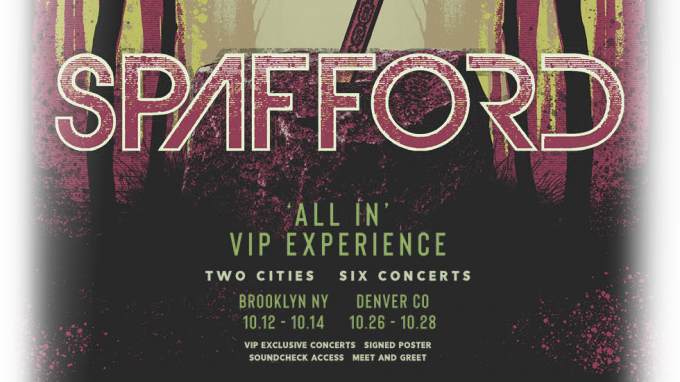 Go “All-In” with Spafford for 3 nights in Brooklyn, NY. Your weekend will begin with 2 shows at Music Hall of Williamsburg with exclusive access to soundcheck & a pre-show Q&A with the band. On Sunday the band will perform a private VIP-only concert at Rough Trade where they’ll also join VIPs for a Meet & Greet. There will be an on-site event host to greet you all weekend long, plus you’ll commemorate the weekend with a signed poster and more. *Already have tickets to see Spafford at Music Hall of Williamsburg on 10/12 & 10/13? All In VIP Upgrades are available that include the perks above, except for 2-day admission to the Music Hall of Williamsburg shows. You must already have tickets to the 10/12 & 10/13 shows in order to redeem the All In VIP Upgrade amenities. Join Spafford in the Mile High City for 3 shows at 3 venues! The weekend will begin at Boulder Theater on Friday where you’ll get prime viewing with early venue entry. Join the band for a pre-show Q&A at the Ogden Theatre on Saturday, and finish the weekend at Ophelia’s Electric Soapbox for a VIP-only concert and Meet & Greet. “All-In” VIPs will take home an exclusive merchandise gift, signed poster, and more. A: Yes – all attendees must be at least 16 years of age to attend the Colorado shows and at least 18 years of age to attend the New York shows. Please be sure to bring a valid government issued photo I.D. Q: How can I attend the concert at Rough Trade on October 14th or the concert at Ophelia’s Electric Soapbox on October 28th? A: The only way to attend these VIP-only concerts at Rough Trade and Ophelia’s Electric Soapbox is to purchase Spafford’s “All In” VIP experience. A: During the purchase process for the New York shows, you will have the option of choosing to have your tickets shipped to you before the show or pick them up at Will Call. If you choose to have your tickets shipped to you, you will still need to check in with us at the event to ensure you get to take advantage of all the perks that come with your package! If you choose to pick up your tickets at Will Call, they will be available at the venue’s Box Office and you will still need to check in with us at the event. For the Colorado shows, the only delivery method will be will call. Your tickets will be available at the venue’s Box Office and you will still need to check in with us at the event to pick up your credentials and merchandise. As it gets closer to the event the ticket purchaser will receive an informational email including the exact time and location for VIP check-in. Please bring valid photo identification, and stay tuned for that email! A: General Admission Tickets provide access to the standing room area, typically on the floor of the venue. This means reserved seating is not included with your purchase. A: VIP check-in will occur approximately 2 hours before the doors to the public open. We will provide the specific times and check-in location for your show in our informational email about one week before the concert. Q: Can I get a solo picture with Spafford during the photo opportunity? A: Due to time constraints, everyone will most likely be organized by the group that they came with for the photo opportunity. A: The on-site event host is basically an extension of our Guest Services team at the event itself. He/she will be available for any questions or concerns that may arise during the VIP program.